Sarah Abruzzese is a former journalist who has written for The New York Times, The Washington Post and other publications. [Note: Bob Benenson, editor of Good Food on Every Table, became acquainted with Abruzzese’s excellent writing when she worked with him as an intern in quite a different venue — at Congressional Quarterly in Washington, D.C.] She currently lives in California where she runs Hug Bug Shoes, her children’s shoe company, and writes in her spare time. Abruzzese discovered Maryland’s Bartlett Pear Inn, located on the Eastern Shore of the Chesapeake Bay, when she was still a D.C. resident. She fell in love with it, as have most diners who have visited this highly acclaimed restaurant since it opened in 2009, and she dined there during a recent trip back east. 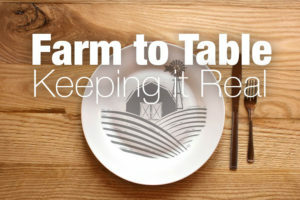 This article, the latest in our “Farm to Table: Keeping It Real” series, is the result. 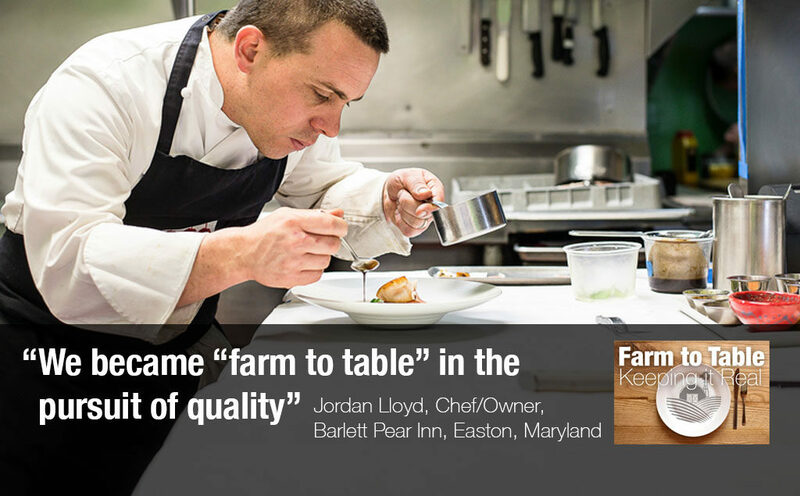 Abruzzese describes how chef Jordan Lloyd’s pursuit of the highest-quality ingredients led him to source from local farmers and make the Bartlett Pear Inn a “farm to table” restaurant — and to start his own farm that grows produce for his kitchen. She tells of how he connected with his farmers, and how they reached out to him. And she tells how he overcame the financial distress with which he grew up to become a culinary star. Jordan Lloyd had zero intention of creating a “farm to table” restaurant. Instead, he and his wife Alice Lloyd looked for the highest-quality ingredients when they opened their 30-seat Bartlett Pear Inn on Maryland’s Eastern Shore intent on bringing guests the freshest, most perfectly cooked, beautifully plated meals. Nonetheless, the Lloyds quickly discovered that the roads to those highest-quality ingredients led to farms in the largely rural area surrounding their home base of Easton, a city of about 16,000 located near the eastern shore of the Chesapeake Bay. Bartlett Pear Inn opened in fall 2009. The chef and his team were an immediate success with visitors, many of whom traveled the 70 miles from either Washington, D.C. or Baltimore to eat and stay in the inn. The restaurant received critical accolades, including a rare first-year 28 out of 30 for food from Zagat. It received glowing write-ups in the Washington Post and Baltimore Sun. 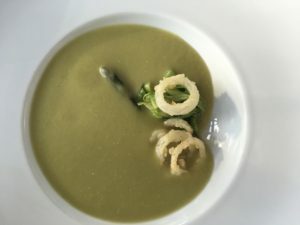 Bartlett Pear Inn’s “Chesapeake Harvest Asparagus Soup,” a puree of asparagus served with buttermilk fried pearl onion rings and preserved lemon-tarragon whipped creme fraiche. Lloyd has not lacked for brilliant chef-mentors. Pursuing quality ingredients is a philosophy Lloyd learned from famed chef Thomas Keller, for whom he worked at Per Se in New York City. Lloyd also worked for Michel Richard at Citronelle in Washington, D.C. and Christian Delouvrier at La Goulue in Miami. Recently he was asked to cook a James Beard Foundation Dinner in New York. The journey to being a restaurateur on the Eastern Shore was not long distance-wise for Lloyd. He and his wife are originally from Easton, and he wanted to bring the success he had experienced in the cooking world back to his hometown. Yet while geographically Easton is where his life began, Lloyd’s journey to owning and running his restaurant was a steep climb. Raised by a struggling single mother, Lloyd describes a childhood that includes being homeless and sleeping in the family car. 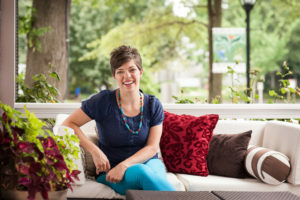 Alice Lloyd is chef Jordan Lloyd’s wife and partner in Barlett Pear Inn. That helps explain why being a business owner and giving back to his community means a great deal to the chef. The Bartlett Pear Inn restaurant, as well as a recently opened bakery across the street, enables Lloyd to support the local businesses who he says in turn support him. Lloyd originally found many of his purveyors by wandering the Saturday farmer’s market and then through word of mouth as one local farmer introduced him to another local farmer. Seven years after opening his restaurant, Lloyd does not care whether you label his restaurant “dirt to table” or “farm to table,” a term that he says has been bastardized by restaurants who state a claim to the title but operate in a far different fashion, from staffing to food. “It’s viral propaganda,” he said. 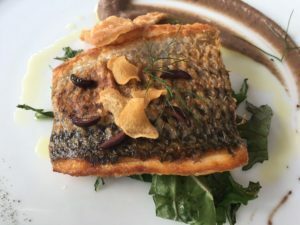 Bartett Pear Inn’s “Pan Roasted Rockfish ‘Pissaladiere'” is a white striped bass served with caramelized onion, anchovy, nicoise olives and a shallot and kale sauté. And while Lloyd is quick to note that not everything in his restaurant is local — no one is selling a Maryland truffle — he says that both his staff and his customers embrace the local origin of many ingredients. Admittedly, Lloyd said there are restaurants even in Maryland that adhere to a stricter “farm to table” definition, including one that refuses to serve lemons because they are not local to the area. But Lloyd says he focuses on bringing the best ingredients to the table. In that spirit, Lloyd again follows Keller’s lead. He built a 4,000 square foot garden just miles down the road in Royal Oaks. The garden produces 90 percent of all vegetables for the restaurant and bakery in 28 raised beds. Lloyd spends part of his days working with his father-in-law harvesting the garden. “This was in the dirt yesterday and is on my table today,” Lloyd said citing a goal is to serve ingredients within 24 hours of being picked. And the chef embraces the notion that it is vital for Americans to understand the food supply and where/how our food originates. Recently Lloyd and a production team finished the first in the series “Life of an Ingredient” thanks to a Kickstarter campaign. The chef, who is deeply involved in his community, has used the film as a teaching tool with schoolchildren and hopes to do more in the future. 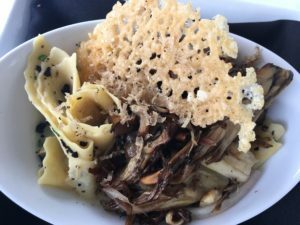 “Inn Made Burgundy Truffle Pappardelle Pasta” is served with maitake mushroom fricassee with black summer truffle butter glaze and garlic and truffle shavings with a parmigiano reggiano crisp. “The movie promotes questions,” he said, adding that it is important for consumers to understand if an animal is humanely raised and what herbicides and pesticides are introduced during the growing process. “The fact that people are questioning where their food comes from and how it is raised promotes a healthy lifestyle,” Lloyd said. And he believes this needs to permeate throughout the U.S. food system — including to fast-food restaurants. “It should be okay to go to the biggest fast food chain in the country and feel like you are eating okay food,” he said. The types of questions that are raised by the movie are exactly those questions that the “farm to table” movement has been prompting for years. And in Lloyd’s eyes those questions have created a real shift in recent years. Lloyd sees much improvement in the food industry as a whole, led by the strength of the movement. Photos of Bartlett Pear Inn menu items by Sarah Abruzzese. Photos of the Lloyds from the Bartlett Pear Inn website, photo credit: Jenna Walcott Photography. This entry was posted in Family Farms, Farm to table dining, Farm to Table: Keeping It Real, Food Artisans, Food documentaries, Food Entrepreneurs, Good Food Dining, Good Food restaurant trends, Local Food, Restaurants and Good Food, Sustainable dining and tagged Bartlett Pear Inn, Easton, FamilyFarmed, Farm to Table, Farm to Table: Keeping It Real, Hug Bug Shoes, James Beard Foundation, Maryland, Maryland Eastern Shore dining, Maryland Farm to Table, Sarah Abruzzese. Bookmark the permalink.